Addiction recovery is a time for re-building, and your time after drug rehabilitation should be represented by practicing the skills and tools you learned in treatment. In addiction treatment at Royal Life Centers, we provide intensive therapies and a range of helpful services to help our guests re-build happy, healthy, successful, and meaningful lives in sobriety. Our substance abuse treatment is for both alcohol addiction and drug addiction, and by using proven effective methods of addiction treatment, we give guests the tools they need to rebuild and start enjoying their lives wholeheartedly. Recovery from drugs or alcohol is a process that occurs in stages. Through out these stages, the brain and body are adjusting back to normal levels. Because alcohol and substance use disorders cause a chemical imbalance in the brain, it is important to heal from their impact— which comes with therapy and time. Since the brain is beginning to rewire itself as you practice healthy behaviors, early recovery is characterized by a lot of big changes and hard work. The most important thing in early recovery, and in the recovery process in general, is to protect your sobriety. Recovery is represented with four pillars, including: health, purpose, community, and home. In recovery, you’ll want to make decisions that support physical and mental health, find purpose through creating meaning in your life, cultivate healthy relationships, and have a safe and stable place to live. Your focus in your recovery journey should be maintaining sobriety, while aligning with these four pillars. Despite your recovery journey being your own, there are still recommended actions to take while in recovery, and things that are not recommended to do in early recovery. What Should I Do in Early Recovery? Of course, the first thing you should do in early recovery is set goals during a period where you begin to stabilize your life in sobriety. In early recovery, we suggest doing things to increase the meaning and sense of purpose in your life. You can achieve this by exploring hobbies, making new healthy friendships, and actively looking for healthy things to do that bring you joy. Making sure your home is as stress-free and healthy as possible will help you maintain sobriety with ease. Our suggestions are to take the first year of sobriety to re-group and rebuild a healthy, happy, manageable, and meaningful life. This includes balancing the four pillars of recovery mentioned above, in addition to enhancing your sober support network. A strong sober support network is vital to lasting sobriety. Before you even consider entering a romantic relationship, you should be strongly rooted in sobriety with a natural flow of living that supports a substance-free lifestyle. Make sure that you have been practicing healthy habits and behaviors to avoid your instinct to regress into addiction-oriented behaviors. The skills and tools you will learn at Royal Life Centers will change your life if you let them. What Should I Avoid in Early Recovery? Because early recovery is a very vulnerable time for recovering addicts and alcoholics, it is extremely important for you to remember to put your sobriety and recovery over everything. You may have heard the phrase “anything you put before your recovery, you will lose” before, which in our experience holds to be very true. There are a few major things to avoid in early recovery, which are pretty self-explanatory. The things to definitely avoid in early recovery are making major life decisions, like getting married, divorced, having a baby, moving somewhere completely foreign to you, and buying excessively expensive items. Despite these more obvious decisions to avoid, there are many decisions that fly under-the-radar and should also be avoided. These lesser-obvious decisions include: making major career changes, taking on more unnecessary obligations that could increase stress, and entering a romantic relationship. It is extremely important to avoid any emotional triggers after completing a rehab program, because you will have less access to professional support, like your primary therapist, case manager, and treatment centers staff. 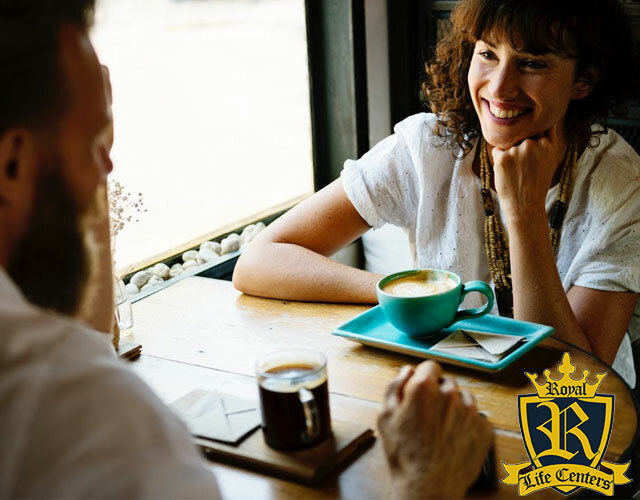 At Royal Life Centers, guests are strongly encouraged to begin building their sober support network in order to make the transition from a rehab center to independent living a much easier process. The skills and tools that we teach guests are designed to set them up for a healthy, happy, and successful sobriety. Major life decisions are best made after the first year of recovery, because the early stages of recovery will already bring major changes in your life— it is best to take this time to adjust to a new lifestyle. At Royal Life Centers, we know that sometimes recovering addicts and alcoholics can’t avoid major life decisions in early recovery— because life happens. In the event that you need to make a major life decision in early recovery, please refer to our resource: The Ultimate Guide to Making Decisions in Early Recovery: The AC²E Method. Why Shouldn’t I Date After Rehab for Drug Addiction? Dating after being in a treatment facility is harmful for a few blatant reasons. First, you are just beginning to re-build your life in early recovery— and your attention should be directed on maintaining sobriety and re-building. Next, drug abuse greatly impacts brain chemistry and the body, which can take over a year to heal, causing instability and a variety of learned behaviors have to be broken in the process. Another reason that cannot be ignored is the vulnerable state that those in early recovery are in. We say vulnerable state, because recovering alcoholics and addicts may still have cravings and little impulse control due to substances causing decreased activity in the part of the brain responsible for decision-making. In addition to these points, entering a romantic relationship can be a massive emotional trigger. Even if you feel strong in your recovery, relationship issues can cause emotional strain due to the emotional investment that goes along with a romantic relationship. By investing so much energy and effort into a new romantic relationship, people in recovery will often put things that their sobriety depends on to the side. What Does Sobriety Depend On? This may seem awkward, but an honest and open conversation about being in recovery can save you a lot of unwanted triggers and harder conversations down the road. If someone you are interested is put off by your recovery, it’s a great indicator to not waste any more of your time with that person. This is a protective measure, and aligns with all of our reasons not to date in early recovery. Maintaining mental and emotional health is a priority. Moving fast in romantic relationships are never a good idea anyway. If you’re dating someone from work, your favorite 12-step meeting, etc. it will disrupt your ability to grow in those places. Keep your daily environments free from added stress and discomfort. Plus, if the relationship ends, it won’t cause any issues in your routine or safe spaces. At Royal Life Centers, we provide comprehensive addiction treatment in all of our programs for drug abuse and alcoholism. We believe in individualized treatment, which is why guests will collaborate with their case manager and primary therapist to build a treatment plan that’s specifically tailored to meet his or her needs and goals. Royal Life Centers offers both short term and long term treatment options. We have a range of treatment programs, including: medical detox, a residential inpatient program, a partial hospitalization program (PHP), an intensive outpatient program (IOP), an outpatient program (OP), sober living and graduate housing. At Royal Life Centers, we also offer services for the family members of our guests. If you are seeking treatment, our drug rehab centers in Washington and Arizona are here to help you; for a list of all of our locations, please click here. If you or someone you love is struggling with an addiction, please reach out to our team of addiction specialists for guidance and support, at (877)-RECOVERY or (877)-732-6837. Our team is available to take your call 24 hours a day, 7 days a week. Because We Care.